Prince Philip has been awarded a knighthood by Australia - sparking a political row in the country. Australians have reacted angrily after Tony Abbott revealed what he believed was his 'greatest achievement' as women's minister. Australian Prime Minister Tony Abbott has said that the overnight raids were prompted by fears that "demonstration killings" were being planned. Speaking at a press conference, he said that police acted on intelligence showing directions from "an Australian who is apparently quite senior in ISIL ... to conduct demonstration killings here in this country". "So this is not just suspicion, this is intent and that's why the police and security agencies decided to act in the way they have," he said. The "new phase" of the search effort for flight MH370 will involve an "intensified underwater search" using specialised sonar equipment towed behind ships to scan the seabed for wreckage, Australia's Prime Minister has said. Tony Abbott added that It was now "highly unlikely" that search teams would find any debris from missing flights MH370. He said that as it has now been 52 days since the disappearance, any debris would have become waterlogged and sunk. A month after David Cameron was ridiculed for tweeting a picture of himself on the phone, Australian PM Tony Abbott has now followed suit. Prime Minister Tony Abbott has told his Malaysian counterpart that Australia "will continue to get to the bottom" of the missing Flight MH370 "mystery". 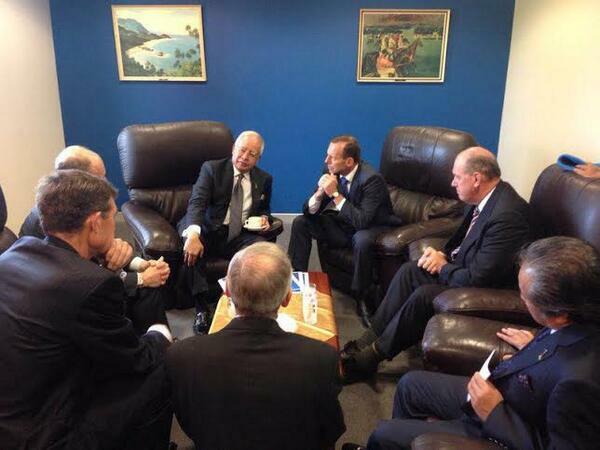 Malaysia's Najib Razak met Mr Abbott in Perth to discuss the search effort and thank those crews who have been involved in the hunt for the Malaysian Airlines jet. "I know that until we find the plane, many families cannot start to grieve. I cannot imagine what they must be going through, but I can promise them that we will not give up," Mr Razak said. 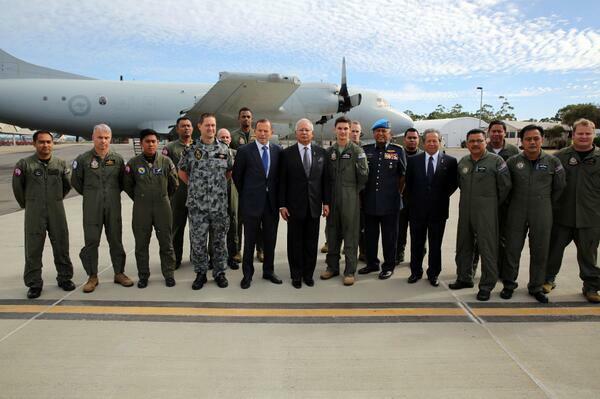 Malaysia's prime minister and his Australian counterpart visited an RAAF base in Perth to thank the crews involved in the search for the missing Flight MH370. Tony Abbott has been sworn in as Australian prime minister at a ceremony in Canberra. Abbott was elected 11 days ago, ousting Labour prime minister Kevin Rudd. Australia's Prime Minister-elect Tony Abbott has vowed to limit foreign aid and curb greenhouse gas reduction measures in a bid to help the country's economy. The money saved is to be invested in road projects in Sydney, Melbourne and Brisbane. Opponents and aid groups say the move is short-sighted and goes against Australia's image of global cooperation. Mr Abbott also plans to visit Indonesia soon to discuss plans for the Australian navy to turn back Indonesian fishing boats carrying asylum seekers hoping to reach Australia.